Autocorrect is useful! Autocorrect is great! Autocorrect helps you present many new mistakes. **prevent (#autocorrectfail). Can't live with it, can't live without it, or haven't yet figured out how to turn it off? Then read on…. Tap anywhere in the autocorrect bubble to reject the suggested word before typing anything else. Tap the Delete key, retype the last letter and the suggested word disappears. Both those steps will get rid of the suggested word -- but they also teach iOS the new word, that's great if you use that word a lot but isn't so hot if you don't use it that frequently. Why? Because in future your device will suggest that word even when you want to write something else, and occasionally insert it when you're typing in a hurry (or leave your spectacles at home). It's a triumph of convenience over good sense! What's to be done? You can disable autocorrect if you like, though when you do you'll probably miss it when you do. 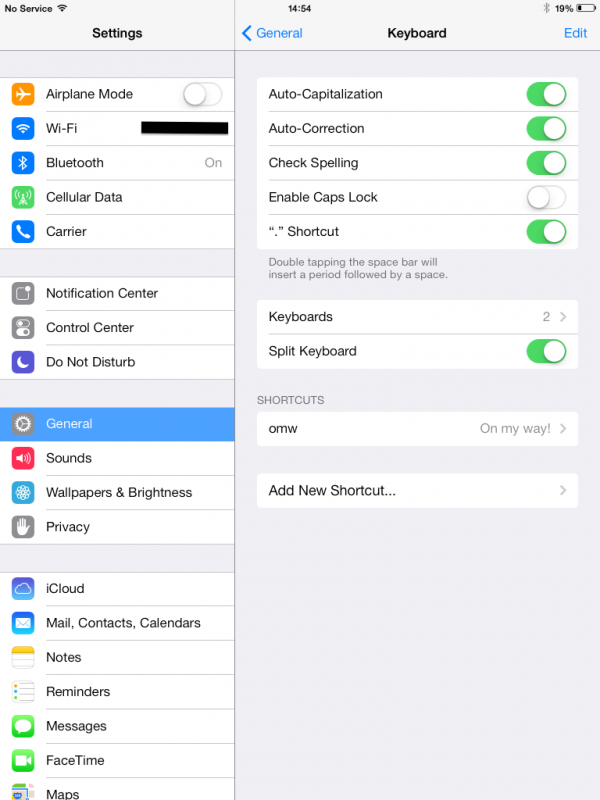 Settings>General>Keyboard>Auto-correction Toggle switch to Off. Unfortunately you can't edit contents of the dictionary iOS uses for autocorrect, so once it learns a word, you are stuck with it. You can take a little more control of it with Shortcuts. My iPad tells me that my system understands the letters 'omw' as On my way! When I tap omw autocorrect will automatically populate what I'm writing with the words, "On my way!" If there's a word you type infrequently that autocorrect has learned, but tends to insert when you don't want to use it instead of a more common word ("tea" instead of "the", for example), then you can use Shortcuts to put things back in order. You can also use this if you frequently type technical terms autocorrect has memorized and keeps trying to replace in place of more common words. Type the word you want to use most frequently into the Phrase field (the, for example) and the word Autocorrect keeps thinking you are typing (tea, in this case) into the Shortcut field. In future autocorrect will use the correct word, though you'll still have to remember to reject its suggestion when you wan to use your less frequently used term. The last resort option is to erase all the words your device has learned in order to return to the default setting. Navigate to Settings>General>Reset and tap Reset Keyboard Dictionary. This will erase everything your device thinks it knows about what you want to type and it will begin trying to learn your habits once again. Those industry-specific words you get tired typing in full can be remembered within your Keyboard dictionary if you turn them into Contacts. Simply create a new contact and type those industry-specific words into the First, Last or Company field of that contact, making sure you put a space in between each of these words. In future you'll see these words pop up as suggested options by autocorrect, which is able to remember words placed into the Contacts database. The bottom line has to be that Apple should put a little time into creating a system to help you manage your autocorrect settings. This could potentially include a weighting system by which you could assign a numerative value to the words you use most often, with the effect of making these the default autocorrect suggestions when typing specific words, or indeed making such words those the system doesn't suggest. Of course, no one will want to go through the entire dictionary to establish which words matter, but a system such as this may prevent a few of these glaring (but excruciatingly funny) autocorrect errors.